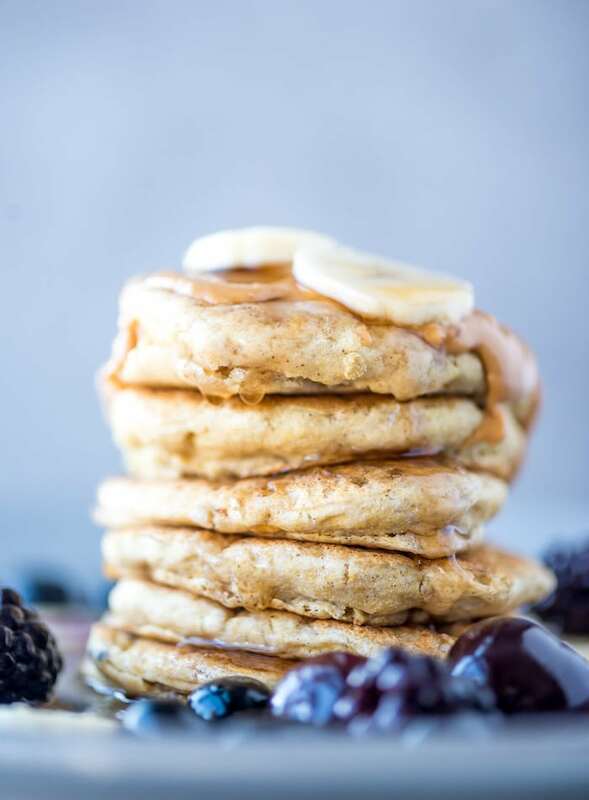 Much like my chickpea flour pancakes, these fluffy vegan quinoa flour pancakes are oil-free, gluten-free and sugar-free. When I went to re-stock my chickpea flour but couldn’t find any, I came home with quinoa flour instead and in the process found a new favourite pancake recipe. I love the fluffy, cake-like texture quinoa flour creates and it’s nutritional benefits are just a bonus. Quinoa flour offers all the nutritional benefits that quinoa does. It’s naturally gluten-free, inexpensive, easy to work with and perfect for fluffy pancakes! 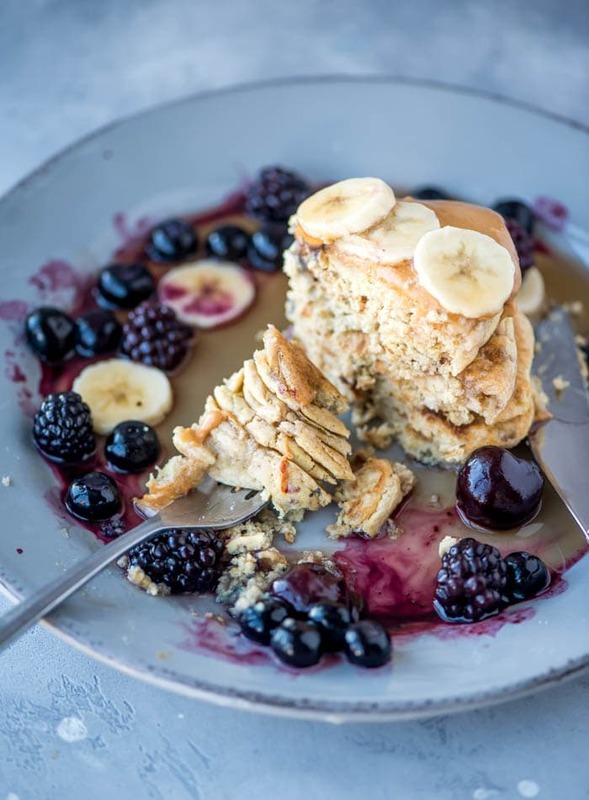 It does have a distinct, earthy, nutty flavour but if you don’t like the flavour of chickpea flour, this might be the option for you and I really love the texture it creates for pancakes. Even if you find the flavour a bit strong when you mix up the batter, I find you can’t taste it once cooked. 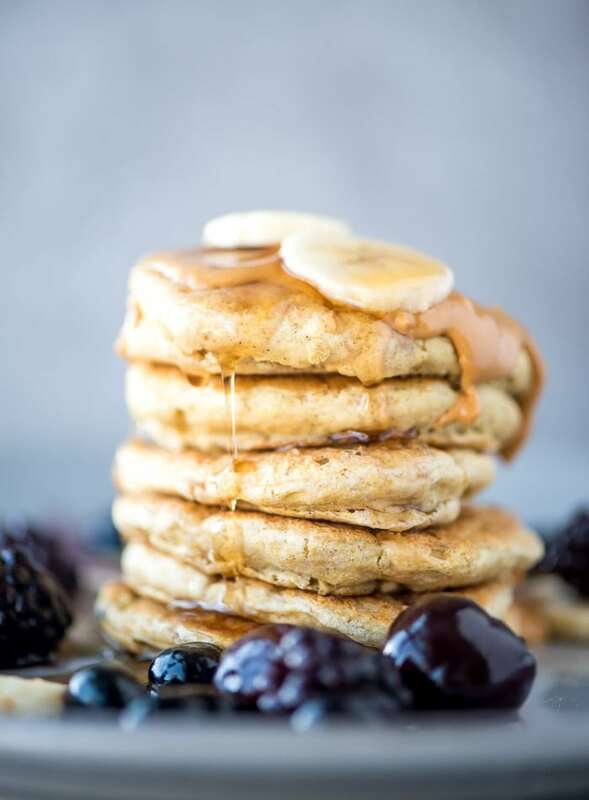 If you’re not into chickpea flour or quinoa flour, I also have a 4-ingredient protein pancake recipe, fluffy whole wheat pancake recipe and chia seed pancake recipe you can check out. 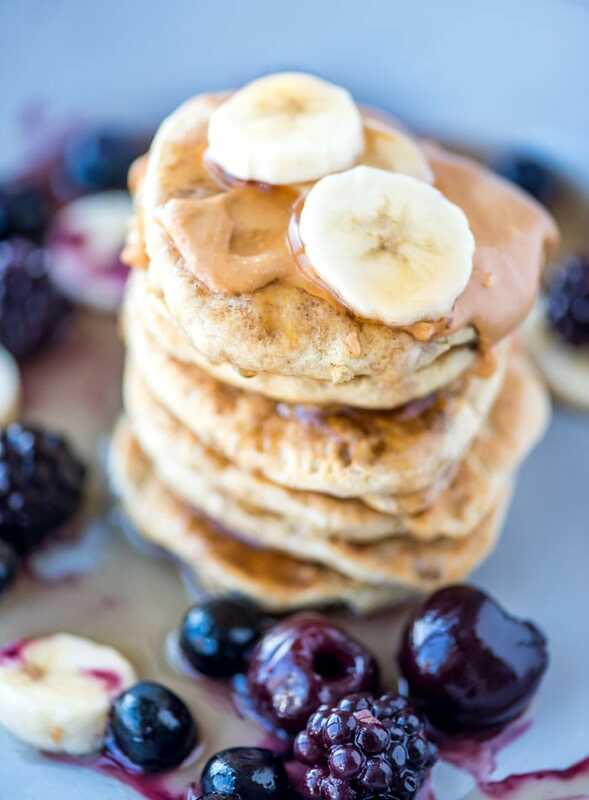 If you’re looking for more vegan breakfast ideas, check out my post with tons of quick and easy vegan breakfast recipes. 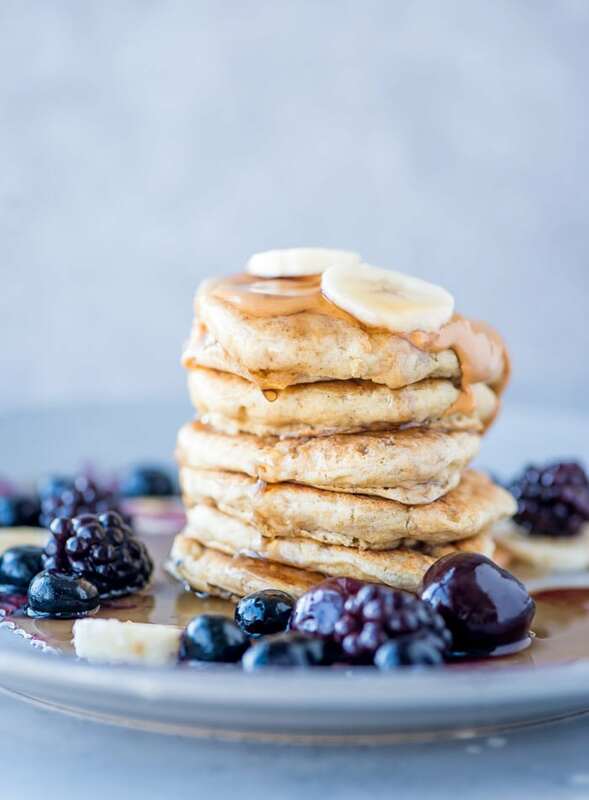 If you’re in a pinch and want to try these pancakes, you can make your own quinoa flour just using your everyday, uncooked quinoa. To make it, blend the quinoa into a flour, then pass it through a fine mesh sieve and blend the unstrained flour again to get it as fine as possible. Repeat this process until you have a very fine flour. I just buy quinoa flour as it’s quite inexpensive and readily available in my area but just know that making your own is an option. 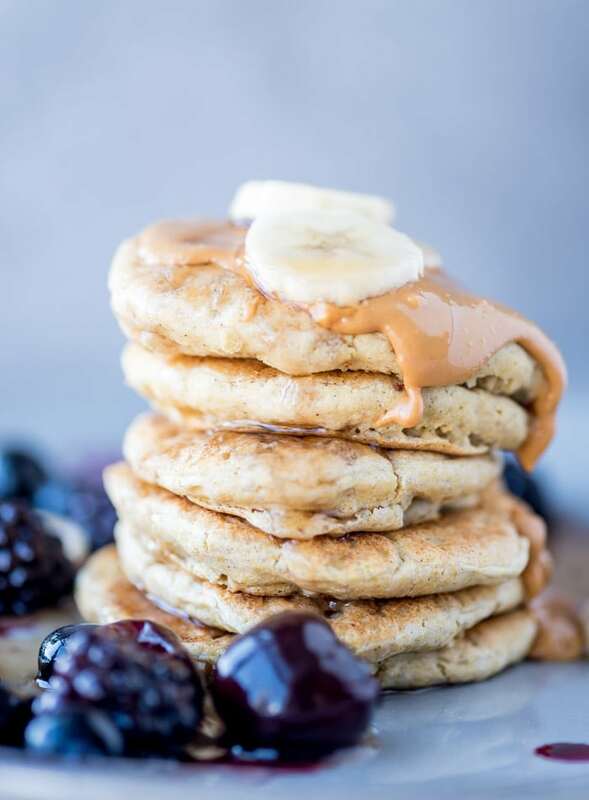 Quinoa flour can be used in baking, added to smoothies for extra protein, added to your oats for added thickness and nutrition and my favourite, used to make pancakes and waffles. It’s my new go-to flour for just about everything! I’ve tested these pancakes every which way and you really can’t fail. All you need is quinoa flour, sweetener, baking powder, salt and water. It works every time. 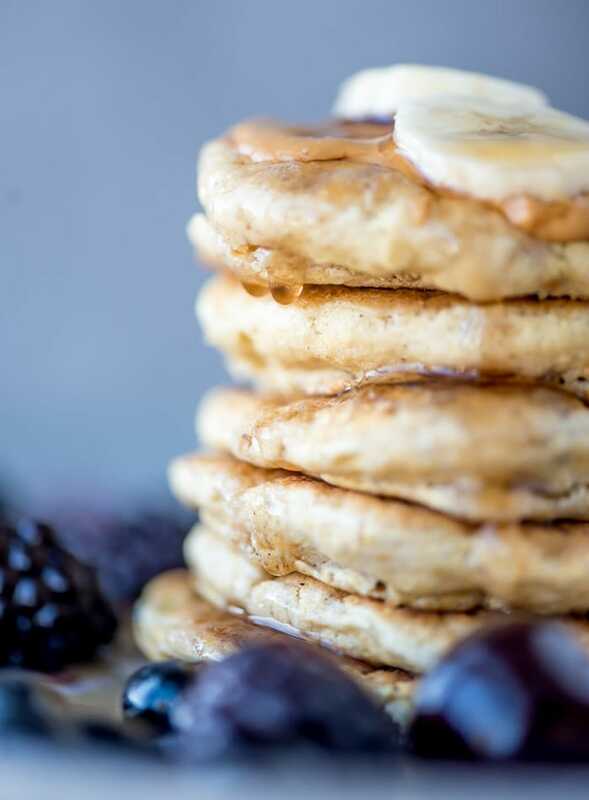 I love simple pancake recipes I can make quickly during the week when I need a pancake fix, so I usually don’t even measure the ingredients for these, that’s how fail-proof they are! With 1/2 cup of quinoa flour, a pinch of salt, a spoonful of baking powder, stevia to sweeten them and enough water to create batter, you’re all set. Sometimes they come out a little fluffier, sometimes a little thinner and more crepe-like but either way, they’re delicious. As I was testing this recipe, I was aiming for a fluffy pancake but you can also make these as thinner pancakes that are closer to crepe. I actually like both varieties but usually lean towards a fluffy pancake because it just seems like more pancake and more pancake is always a good thing. I tested these with about a dozen combinations of baking powder, baking soda, salt, water, milk, lemon and apple cider vinegar. Many recipes call for lemon for acidity but I didn’t find it made much of a difference in the fluffiness, so I ended up leaving it out in the final recipe just to keep things as simple as possible. Mix the dry ingredients together thoroughly before adding the water. Once you add the water, gently fold together until “just mixed” without over-mixing the batter. Let the batter sit for a good 5 minutes. It will expand and get light and fluffy. Make sure the pan is pre-heated. I set the element just above medium heat and then let the pan heat for at least 5-10 minutes. Let the pancakes cook until edges are browning and they look almost cooked through. Do not use milk in this recipe, I found water to produce a much better texture. Once you add the water, the baking powder will react and start to puff up. The batter will become light and airy so it’s not your typical thick, pourable pancake batter. Rather than pour it into the pan, you kind of scoop it and spread it around with a spoon to get the size you want. Also, the batter does not taste particularly good before you cook it but once it’s cooked, the pancakes are delicious! I’ve made these many times without the ground flax and it’s not totally necessary for the pancakes to work, however I find it lends to a sturdier, slightly denser (but still fluffy) pancake. If you’re in a pinch, you can leave it out. Those are just a few of my favourites. My go-to is usually peanut butter and berries or tahini and maple syrup. What are your favourite pancake toppings? I’d love to know! 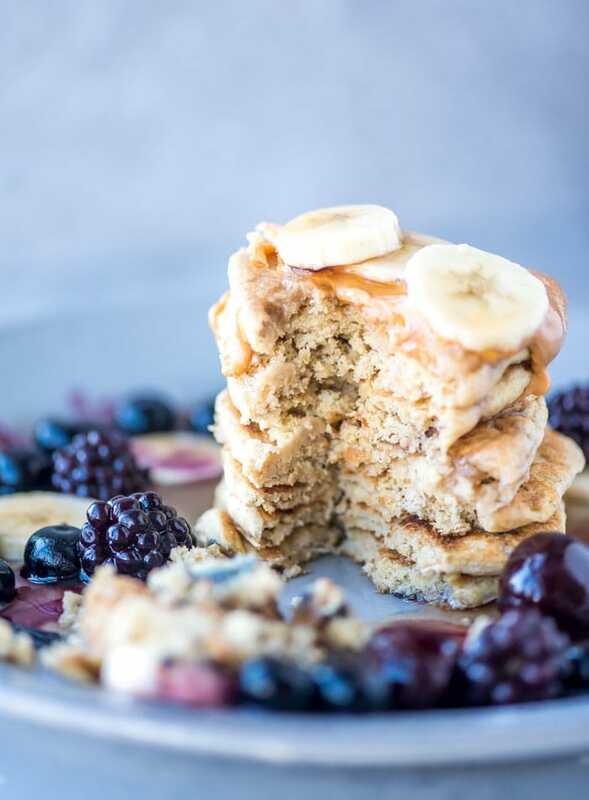 These vegan quinoa flour pancakes are extra fluffy and extra easy to make. You only need a couple of ingredients and a few minutes to make them! Mix the ground flaxseed and warm water together in a small bowl and let sit for 3-4 minutes. Thoroughly mix the dry ingredients together in a mixing bowl. Add the water and flax mixture and gently fold together until “just mixed.” Let the batter sit for 5 minutes. While it sits, heat a pan over medium. Spray the pan with non-stick cooking spray then scoop the batter into the pan to create your desired size of pancakes. I usually make 5-6 small pancakes but you could go for 3-4 large ones. Let them cook until the edges are browning and they look almost cooked through. Serve right away with your favourite pancake toppings. This recipes makes 4-5 medium-sized pancakes or 1 serving. I haven’t tried doubling or tripling it. I haven’t tried this recipe with any other sweetener but you should be able to use maple syrup, coconut sugar or another sweetener of choice. You can make these without the flax but I find the flax makes them just a bit sturdier. You can reduce the baking powder to 1-2 and use a bit more water for a thinner, crepe-like pancake. If I were to use maple syrup or honey instead of stevia, how much do you suggest to use? Thank you! 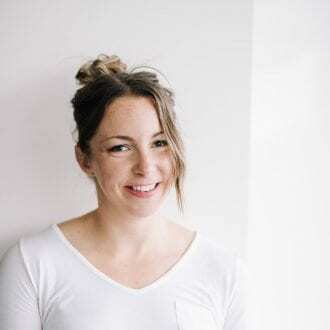 Maybe 1-2 tbsp? Just taste the batter, it should be slightly sweet. Although it does not taste very good when uncooked but don’t worry, they taste great after! How do you get the flax to be evenly distributed throughout the batter? Mine ended up just clumping in one section. Try mixing the additional water and flax egg before adding to the dry ingredients. Or just adding a bit more water to the flax egg so it’s not so thick. You could also just mix the ground flax with the dry ingredients instead of making an egg first, it will have more or less the same effect. Just let it sit for a few minutes before cooking. Like I said in the notes too, I’ve made the recipe without flax and it still works! I tried them again this morning, adding an extra tablespoon of water to the flax and mixing it with the water before adding it in, and it worked so much better. Thank you for the suggestions and the delicious recipe!! Came out really well. I’m so happy I found my go – to pancake recipe without all the bad ingredients needed. I added 1 tbsp maple syrup as I didn’t have stevia and turned out fine. I’m so very happy to hear that! Finding a good go-to pancake recipe is the best. It came out so bitter! What did I do wrong? What did you use for a sweetener? It’s bitter after cooking them? The raw batter doesn’t taste great but they taste good after cooking! It could depend on the brand of flour used as well as they do vary in flavour and quality. My pancakes were bitter too and are used Bob’s Red Mill flour. I read online where you can bake your quinoa flour to extract the bitterness before cooking with it, I’m going to try it. Otherwise it was a pretty good pancake . I tried this just now with my breakfast-style dinner, and mine too were very bitter(followed recipe exactly). They taste strongly of the way quinoa smells when rinsed, which makes a difficult pancake to enjoy. Also, tasted the baking powder too. If I try this recipe again, and I use the ‘Bob’s Red Mill’, I will re-review the difference here. In the mean time, I guess I’ll have to use the rest of my bag on savory vegetable fritters and hope for the best! Thanks for the feedback! Hopefully they work out better for you next time!! Thank you thank you thank you. I use half the water to mix the flax. Then once it was mixed with the dry ingredients I added a splash of almond milk. I’ve just started a health challenge so this is a nice change from all the sickly green vegetables! Wonderful! So glad you enjoyed them. I was able to make fluffy pancakes (replaced the flax seed with coconut flour). However it was very salty. Love this recipe. Thank you.. I doubled it and added a tsp of cinnamon otherwise made exactly as written.. Wonderful. So glad you enjoyed them!